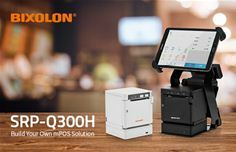 BIXOLON Co., Ltd, a leading global mobile, label and POS printer manufacturer, today announced the addition of the SRP-Q300H 3-inch Direct Thermal B-gate mPOS printer to its innovative SRP-Q300 series. Offering flexible receipt and ticket printing from Android™, iOS™ and Windows® devices, the SRP-Q300H creates a complete mPOS solution with a smaller footprint with competitive pricing. Native App Print™ – The ability to print data from an installed native app of a smart device. Accompanying BIXOLON’s B-gate SDK’s for Android™, iOS™ and Windows®, programmers can easily build mobile applications to control the printer and connected peripherals.